In 1998, Pearson抯 sales grew from �293m to �395m and operating profit, before goodwill and other items, from �8m to �9m. Profits at the FT Group rose by 9%, despite the disposal of non-core activities and substantial investment in the growth of the newspaper and electronic services. The continuing success of the Financial Times newspaper again contributed strongly to the overall performance. Pearson Education also increased its operating profits by 28%, before taking account of the contribution made in December by the Simon & Schuster businesses and the related integration charges. This growth was driven by the success of our US school business and the benefit of lower restructuring charges. The Simon & Schuster businesses, acquired at the end of November, recorded operating profits of �m during December. The operating profit of the Penguin Group fell by 17%, due principally to several non-recurring items, including a � provision for the closure of the Ladybird site at Loughborough. Penguin UK, in particular, had a very strong year. Pearson Television抯 operating profits more than doubled to �m, thanks in large part to a full year contribution from All American Communications, acquired at the end of 1997, and to a reduction in start-up losses from our investment in Channel 5. As we continued to sharpen operations across Pearson in 1998, so we also continued to reshape the Company by building stronger market positions in a smaller number of businesses. We sold businesses that either lacked real market scale or which we believed were worth more to others than to Pearson. And we continued to dispose of passive investments which brought us no strategic value. We sold the Tussauds Group, Mindscape, Pearson New Entertainment, our specialist law, tax and medical publishing operations, our 20% stake in the Canadian Financial Post, our 6.3% stake in SES (the owners of the Astra satellite system), our stake in Flextech, and made a number of smaller disposals. In total, we raised �3m from these disposals. We also continued to invest in building businesses in markets with good growth prospects where we have a chance to become a leading player. We抎 begun this process with the acquisitions of Putnam Berkley in 1996 and All American Communications in 1997, which enabled Penguin and Pearson Television to build strong positions in consumer publishing and international television production. And we抎 also started to make substantial revenue investment in the international and electronic expansion of the Financial Times. In 1998, we made our single biggest investment with the acquisition of the Simon & Schuster education, business & professional and reference divisions from Viacom Inc. for �9bn. With this further tightening of our portfolio, focusing on a smaller number of larger, more actively managed and complementary businesses, where and how we make our sales and profits continues to shift. For example, in 1998, 31% of our sales were in education. In 1999, we expect that more than half will be. In 1998, 48% of sales from continuing operations were earned in North America and this is likely to increase significantly in 1999 as we consolidate the first full year results from the Simon & Schuster businesses. As the changes in the Company's portfolio increased the proportion of sales and profits earned in overseas currencies, the strength of sterling had a modest but negative impact on our published results. If exchange rates had remained at 1997 levels, it is estimated that total sales would have been higher by £45m and operating profits by 6m. Stripping out the benefit of lower restructuring costs and portfolio changes and the adverse impact of exchange rates, underlying operating profit increased by 8%. 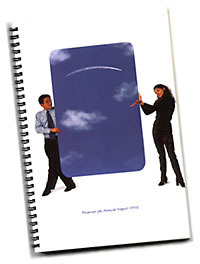 The Pearson 1998 Annual Report is available for download (4.8MB) in Portable Document Format. You can download the PDF viewer free from Adobe. Alternatively an Annual Report can be ordered online from the FT Annual Report Service.